The findings of a study in which Friesian horses underwent standardized exercise tests support previous research that the breed may their anaerobic threshold faster than other breeds. The anaerobic threshold is the moment during intense exercise at which lactic acid starts to accumulate in muscles, when anaerobic processes become more dominant. During exercise, muscles with adequate fuel and oxygen are able to function aerobically, with limited fatigue. However, during higher intensity exercise, when oxygen gets in short supply, muscles come to rely on anaerobic metabolic reactions that do not require oxygen, resulting in lactic acid buildup. Researchers in the Netherlands said most Friesian horses reached their anaerobic threshold during a standardized exercise test which required lower intensity exercise than daily routine training. Catherine Delesalle and her colleagues set out to study the strengths and weaknesses of an alternative standard exercise test (SET). Friesian horses are renowned for their impressive trot with high knee action. However, cantering is a much more difficult gait for them. Two different SET protocols, A and B, were applied regularly during a two-month training period for nine young Friesian dressage horses. Protocol A, which lasted 21 minutes, involved a relatively long episode of cantering (four minutes continuously), whereas protocol B, which lasted 24 minutes, alternated only short episodes of canter with the trot and walk. However, the total cantering time was the same for both protocols. The study team monitored blood lactic acid after cantering, the average heart rate in trot, and the maximum heart rate in canter. Blood lactic acid after cantering was significantly higher in protocol A compared to protocol B, and the maximum heart rate in canter was significantly higher in protocol A compared to protocol B. Most of the Friesian horses crossed their anaerobic threshold when performing protocol A, a finding which was in accordance with previous reports suggesting that Friesian horses reached their anaerobic threshold quicker than other horse breeds. Most of the horses showed a significant training response based on a follow-up testing of blood lactic acid. Horses with the lowest fitness at the start displayed the largest training response. Blood lactic acid levels were significantly lower in week eight compared to earlier weeks under both protocols, signaling the improving fitness of the horses. A significantly decreased blood lactic acid level after cantering was noticeable in week six under protocol A whereas it was week eight under protocol B. The study team, writing in BMC Veterinary Research, said young Friesian horses reached their anaerobic threshold during a standardized exercise test which required lower intensity than daily routine training. “Therefore close monitoring throughout training is warranted,” they said. Blood lactic acid proved superior to heart rate in assessing training response over time, they said, with the latter best monitored at the trot rather than the canter. The concluded that protocol B, without the long cantering period, was best suited as a template for daily training in the aerobic window. Discussing their findings, the study team said that the relatively long four minutes of continuous canter under protocol A might have caused the young horses to reach their anaerobic threshold of 4 mmol/L much earlier. “Another possible explanation … is their muscle fibre composition,” they wrote. It was to be expected, they said, that the shorter cantering intervals under protocol B would limit lactate accumulation and heart-rate peaks. Indeed, the frequent changes in gait and directions incorporated into protocol B allowed for intermittent recuperation. The two protocols were always performed with a two-day interval, but always in the same order – B was always preceded by A. Both protocols, they said, were suitable to assess training response in the studied horses. However, A had a greater discriminative value than B, since a distinct training response could already be identified at week six under A, whereas in protocol B it was in week eight. The heart-rate findings supported the hypothesis that the canter was quite a difficult and energy-demanding gait for Friesian horses, they said. “The fact that canter is an exciting event for horses and not only an effort probably partly explains why correlations between blood lactic acid and heart rate at canter are less consistent. “Striking in our study is the fact that horses with the worst training parameters at the beginning of the training, also showed the largest training response. “Horses that had the highest heart rates and blood lactic acid concentrations in week 0, also showed the largest response to training. While protocol A had the highest value to follow-up training response, protocol B provided a solid template to train Friesian horses in the aerobic window. The study team comprised Cornelis Marinus de Bruijn, Willem Houterman and Berit Boshuizen, all from Wolvega Equine Hospital; Margreet Ploeg, from Utrecht University; Bart Ducro, from Wageningen University; Elisabeth-Lidwien Verdegaal, from the University of Adelaide; and Catherine Delesalle and Klaartje Goethals, both from Ghent University. 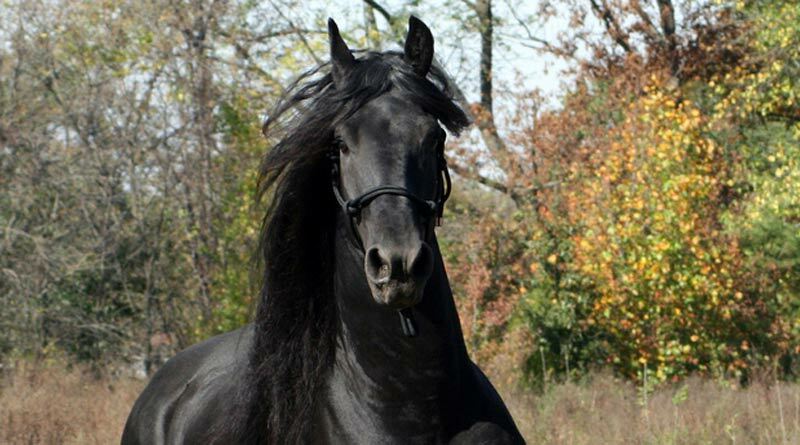 Friesian It’s the most beautiful race in the whole world.